We arrived in Punta Arenas last night around 10 p.m. local time. Carola, a representative from the support group, AGUNSA, met us at the airport and arranged transportation to a local hotel. It was good to finally take a break from traveling. We had about 28 hours of airports and airplanes since leaving Denver, and we were ready for a little sleep. This morning we walked through town on our way to the AGUNSA warehouse at the seaport. We made sure to pay homage to the statue of Ferdinand Magellan. 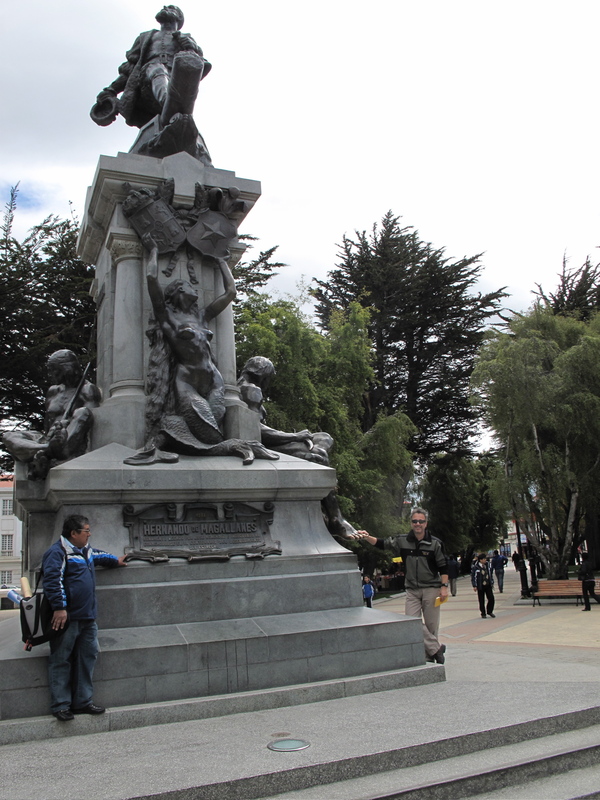 For good luck in Antarctica, you must rub the brass toe of one of the figures on the Magellan statue. If you travel through Christchurch, New Zealand, you have to go find the statue of the famous polar explorer Roald Amundsen and rub his nose. That statue of Amundsen has what is possibly the shiniest nose of any you’ll see! Further on, at the warehouse, the equipment manager, Octavio, outfitted us for the wilds of the Antarctic Peninsula. Many thanks, Octavio! After gathering various odds and ends, we strolled down the pier for a spur of the moment visit to the British Research vessel RRS James Cook, one of the newest research ships on the sea. Built in Norway, the James Cook operates worldwide, from the tropics to the edge of the ice sheets in Greenland and Antarctica, enabling cutting edge multidisciplinary research. The Chief Officer, Richard, showed us around the very modern vessel, pointing out the research facilities and the impressive engineering spaces. Later this afternoon, we’ll be out gathering last minute equipment for the field (a pair of field glasses or binoculars and some treats from the local market).